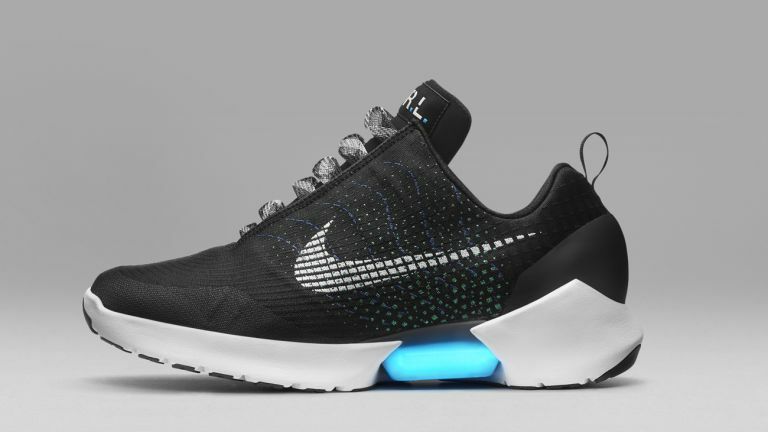 Meet the Nike HyperAdapt 1.0 - the most futuristic trainer ever created. The new sneaks actively tighten as you slide your foot inside. A series of sensors, based mostly in the sole of the shoe, read the pressure applied by your foot, which in turn tightens the laces to fit your size and shape. What is the reason or this? It removes the distraction of fumbling around with traditional laces. Duh! "When you step in, your heel will hit a sensor and the system will automatically tighten,” explains Tiffany Beers, Senior Innovator, NIKE, Inc, and the project's technical lead. "Then there are two buttons on the side to tighten and loosen. You can adjust it until it's perfect." The goal is to make the adjustment automatic without the buttons, which would move these from a gimmick to a useful innovation. Can't wait to slip your feet into the future? You'll have to! The HyperAdapt 1.0s won't be available until 'Holiday Season 2016' - that's Christmas to you and I. It also had plenty of other cool little additions to its range, including the development of NikeGRIP, a new anti-slip sock that could see the end of slippery feet swishing around inside ill-fitting footwear. Modern footwear thinking suggests that sliding occurs between the sock and the shoe, but as Tim Clark, design director Nike Socks explains, "Athletes tell us that slipping happens as much between the foot and the sock as it does between the sock and the shoe. Our goal was to perfect 'grip' both inside and out of the sock to create a unique solution for athletes." The idea is that, without the distraction of wrinkled socks, athletes can concentrate on running faster. Also, it's a cool thing.